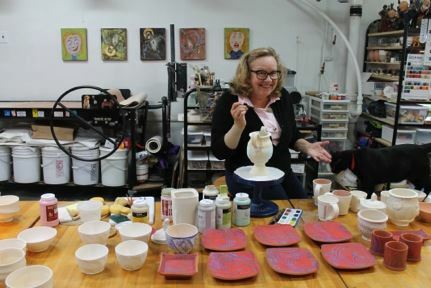 This action packed, 2 1/2- day, hands on workshop with Tracy Gamble will focus on application of AMACO’s main cone 5/6 - glaze lines (Potter’s Choice, Celadon, Satin Matte and Shino). Special decorating techniques using Velvet Underglazes, drawing on leather hard and bisque clay and additional bonus demonstrations (newsprint image transfer onto leather hard and bisque using Underglaze) are all part of the action. Bring bisque fired test tiles and small pot test creations to class to experiment on with AMACO (American Art Clay Company, Inc.) cone 5/6 glazes. Tracy is delighted to share tips and techniques for applying, combining, accenting and testing with these glazes. Glazes will be provided by AMACO. The plan is to fire our tests and experiments in the kilns, on site, each day. Bring your favorite sketch book, glaze brushes and your sense of adventure! Open to all skill levels. Lunch will be provided for both Saturday and Sunday sessions. Each attendee must bring bisque of 15 – 20 test tiles and bisque of 10 – 15 small bowls, cups, plates or vases (one pounders – hand built or wheel thrown) on the first day of the workshop. All of this bisque must be made from a cone 5/6 clay body.